Healthcare, Education, Municipalities and Industry! 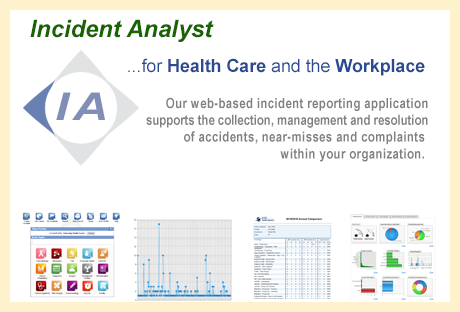 CCD’s Incident Analyst version 4 (IA-v4) promotes the accurate recording, tracking, and resolution of unusual events whether they involve patients, students, employees or the general public. The user interface is a browser-based application that supports the submission and management of events by anyone involved. IA-v4 was developed using the latest, innovative technology to simplify and expedite every aspect of the data collection process. Each type of incident can be configured to follow a unique workflow process (i.e. routine complaints can be handled differently than security related incidents). Likewise all questions are tailored based on the type of incident, where it happened, the severity, and whether the incident is considered confidential. Using the Configuration Utility, any number of questions, alternatives, codes, departments, incident types, and phases can be created without having to contact CCD. The sophisticated security system exceeds privacy protection legislation by restricting access based on incident types, departments, phases and severity. Audit files continuously monitor changes and the security system tracks all unauthorized access. All of our products fully support multiple site locations both in terms of facility-based data collection elements as well as reporting on a hierarchical and functional basis.